Sporting News’ hockey experts Brandon Schlager, Jim Cerny and Jackie Spiegel predicted the final standings for the 2018-19 NHL season. The playoff seeding below was determined by the average finish for each team based on our combined projections. 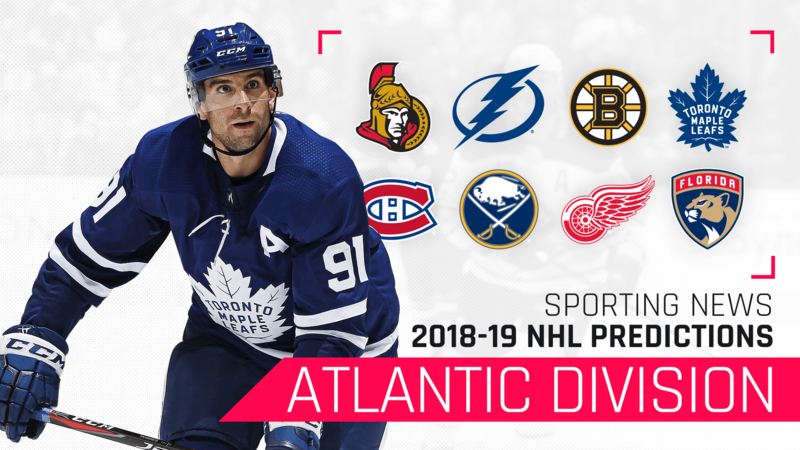 For a season in which the NHL came to expect the unexpected, the 2017-18 Atlantic Division race played out eerily as planned. The Lightning, Maple Leafs and Bruins emerged as elite contenders and formed one of the most hotly-contested and top-heavy divisions in hockey. Entering 2018-19, it’s easy to write in any of those three teams as a Stanley Cup favorite. John Tavares’ Toronto homecoming adds to the intrigue and could elevate the Maple Leafs to their first division title this millennium. But the incumbent champion Lightning, insurgent Panthers and a young Bruins team crowd the top of the Atlantic. Speaking of Florida, the Atlantic champion in each of the last three seasons missed the playoffs entirely the year prior to their title. Stranger things have happened. What more can be said about the Lightning? For the last five years, Tampa has been the toast of the NHL, save for a Steven Stamkos-less hiccup in 2016-17. They bounced back into the playoffs last season, having nearly claimed the Presidents’ Trophy inside the most top-heavy division in hockey. Consensus says it’s a matter of when — not if — the Bolts win a Stanley Cup, and they’ll again open 2018-19 as the odds-on favorite to do it. Like other top contenders in Nashville and Winnipeg, the Lightning kept status quo this summer, instead signing Nikita Kucherov and Ryan McDonagh to long-term extensions. Their pursuit of Erik Karlsson was well-known, but that would have been a luxury. a defense corps with reigning Norris winner Victor Hedman. Instead of a super team, the Lightning are merely the same as 2017-18: One of the most dynamic and dangerous teams in the NHL. The sudden departure of Steve Yzerman and a looming cap crunch are non-concerns as far as making another deep playoff run this spring is concerned. John Tavares is a Maple Leaf. Have you heard? The collective hockey world has already tired on talking about the Leafs, no doubt, but get used to it. The former Islanders captain is in it for the long haul and so is his new team, who are about to feel the full force of those heightened Stanley Cup expectations inside hockey’s biggest fish bowl. The lineup in Toronto, easily the NHL’s deepest down the middle, has been dissected up, down, left and right. All that’s left now is watch how it all comes together. Imperfections still remain, of course. Even Tavares can’t patch up the defense, which has Morgan Rielly, Jake Gardiner and a bunch of question marks behind them. Who will replace James van Riemsdyk, Tyler Bozak and a some of the production on the fringes that left via free agency? Auston Matthews will feel the heat, too, especially come playoff time. All of that is splitting hairs and likely inconsequential, though. A deep postseason run is the new bar, and the Leafs won’t be given a pass because of their division. Anything short of Toronto’s first series victory since 2004 will be scrutinized for months on end next summer. The Panthers finished the 2017-18 season as the hottest team in the NHL, going 25-8-2 over their final 34 games — and breakneck 125-point pace. But their dismal first half, bogged down by injury and inconsistent play before the calendar turned to 2018, made salvaging a playoff berth nearly impossible. Hoping to pick up where they left off, the Panthers have become a chic pick to disrupt the playoff order in the Eastern Conference. The addition of Mike Hoffman, who insists his off-ice issues from Ottawa won’t transfer to South Beach, makes Florida’s top six one of the scariest in the league. Perennial Selke contender Aleksander Barkov has a new “C” on his chest and the talent to emerge as a darkhorse MVP candidate, should the Panthers fulfill everyone’s expectations. We’ll say it one last time: Imagine where this roster would be if Dale Tallon hadn’t given the Golden Knights expansion gifts Reilly Smith and Jonathan Marchessault. While their biggest opponents in the East got better (or at least stayed the same), the Bruins bled out this summer, losing high-priced deadline acquisition Rick Nash to health concerns and a handful of important role players to free agency. Even more than last season, when Boston rostered a half dozen rookies at times, coach Bruce Cassidy is counting on youth to fill those voids behind arguably the best first line in the NHL. Most notably, the Bruins are expecting big years from Charlie McAvoy and Jake DeBrusk. Ryan Donato, Jakob Forsbacka Karlsson​, Danton Heinen, Anders Bjork … you get the picture. Not to mention Tuukka Rask, who somehow still draws his share of critics. The Bruins enter 2018-19 looking awfully ordinary after the Lightning made them look foolish in the playoffs last year. Sabres GM Jason Botterill entered the summer with a plan to rid the roster of predecessor Tim Murray’s remaining influence. Mission accomplished, as perhaps no team in the NHL saw a greater volume of change up and down the roster after another dead-last finish — their third in five years. Buffalo is another popular pick to make major gains in 2018-19, led by darkhorse MVP candidate Jack Eichel and the introduction of No. 1 overall pick Rasmus Dahlin to the NHL. But those expectations hinge on a lot of “ifs.” Can career backup Carter Hutton, 32, reciprocate a career .915 save percentage in his first season as a full-time netminder? Can Jeff Skinner regain 30-goal form alongside Eichel? How will Dahlin adjust? Are the Sabres expecting too much, too soon from blue-chip prospect Casey Mittelstadt as the team’s No. 2 center, replacing Ryan O’Reilly? Time will tell if it all works out, but this is decidedly Botterill’s vision now. At least, that’s something to believe in. The clock is ticking on Marc Bergevin in Montreal. Another head-scratching trade has the potential to backfire if Alex Galchenyuk excels at center in Arizona and/or Max Domi struggles, bringing with it yet another barrage of criticism toward the NHL’s most embattled general manager. In some eyes, 2018-19 is over before it starts for the Canadiens with Shea Weber out until December. It’s up to Carey Price and Jonathan Drouin to carry the team in his absence, and it’s not a sure thing either will return to previous levels. There have been mild tinges of good faith as Habs fans watch No. 3 overall pick Jesperi Kotkaniemi stand out in training camp. If he sticks on the roster all season and the Canadiens don’t flop, maybe that dread will turn to optimism for the future. Henrik Zetterberg’s untimely retirement was a gut punch to the Red Wings’ already meager 2018-19 competitive outlook. But in an unfortunate way, it lays ground for transitioning into the next era of Detroit hockey the franchise has been, until recently, reluctant to embrace. It’s a team led by Dylan Larkin, Anthony Mantha and Andreas Athanasiou now. And while that group may not inspire confidence, the Red Wings’ 2018 draft class does, led by Filip Zadina, who may immediately join those three as an NHL difference-maker as a 18-year-old. So the outlook isn’t entirely grim, especially because 2019 eligible phenom Jack Hughes could be the prize that sends this rebuild into warp speed. The Senators produced a year’s worth of juicy headlines fit for the tabloids. It’s dysfunction on a scale unseen in the NHL in years — maybe decades — and led to the trade of face of the franchise Erik Karlsson, himself a victim to the toxic culture created under owner Eugene Melnyk. Karlsson’s departure could mean Ottawa is about to turn the page on this soap opera, the darkest single year in franchise history. More likely, a lack of public confidence in Melnyk and his braintrust will continue boil over in other ways as the Senators project to finish even further down the standings in 2018-19. Trading Matt Duchene and Mark Stone has become necessary to make up for missing out the franchise-altering player Colorado will select with Ottawa’s 2019 draft choice.